If you own a business, you might want to become a Liberty Merchant. There are many benefits to this program, including the fact that you can get Liberty Dollars at a 15% discount off the Base. That means that any time you can give Liberty Dollars in change, you make an additional 15% of the amount you give out as extra profit. You'll also find that local citizens will like the look of the currency and enjoy using it to buy from you again, and that will lead to other Merchants following your lead. Most Liberty Merchants use the currency that accumulates to do their own shopping with other Liberty Merchants, so all of you can see a substantial increase in your bottom lines. 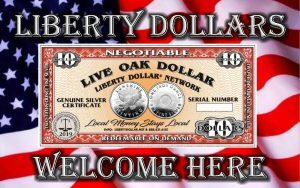 Registering as a Liberty Merchant costs only $6.95 per month and gets you listed here on our website, so that LDN Members near you can find out that you'll take their Liberty Dollars. As the program grows, you'll begin to see Members who are passing through your area seeking you out so that they can spend LD at your establishment. Since all Liberty Dollars are backed by Silver, you can always get your silver value back from them even if they aren't from your own community, but you'll probably find that "Out-Of-Town" Liberty Dollars will be quite collectible. It won't be long before you'll know who will want them when they find their way into your business. It also means you can sell your Silver Holding back to us when you need to convert it to regular cash. We'll buy it back for the same price you would pay for it, less a 10% restocking fee. You can read the new Liberty Merchant Handbook HERE. You can become a Liberty Merchant and start enjoying the benefits at any time. Just click the button below and we'll be in touch right away to get you listed and explain all the benefits of registration.